“Viking warrior daughter” is how Emily Otto’s father refers to her before his friends. And he’s right. Otto is a twenty-eight-year-old cadet in the Texas A&M Army Reserve Officer Training Corps and second-year graduate student at the Bush School of Government and Public Service. She’s held the rank of Sergeant in the US Army, she’s studying defense and cybersecurity policy, she works out three times a week, and she speaks German. When she commissions this spring, she will be the first officer to branch from Texas A&M into Cyber as a Cyber Operations Officer. A 2011 graduate of the University of Louisville, Otto majored in history with a concentration in military history. Her decision to enlist in the Army came two years after graduating and “working every job [she] hated” and speaking with a recruiter. Otto enlisted in 2013 and after basic training and an intelligence operations course was stationed in Fort Hood as a human intelligence collector with Higher Headquarters Battalion, 1st Cavalry Division. While at Fort Hood, she decided to pursue a commission with the Army but was scheduled for deployment to Kandahar Air Field in Kandahar Provence, Afghanistan. Prior to deployment, Otto spoke with the Texas A&M ROTC staff regarding a graduate degree in military history. Otto enrolled at the Bush School in August 2015 after receiving a special separation from active duty, an application process that took almost a year from her initial acceptance. She was awarded a Green to Gold scholarship, given to enlisted individuals to earn an Army commission under the condition they will return to the Army. 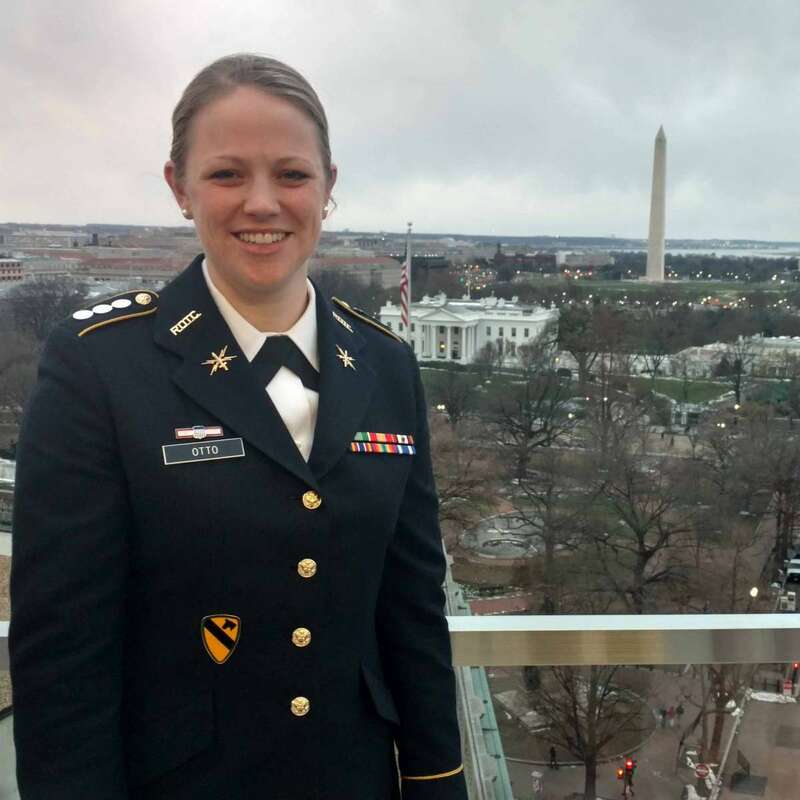 Once on campus, Otto dove headfirst into her coursework, ROTC commitment, and campus organizations. Within ROTC, she attends biweekly class, monthly field training exercises, weekly labs, and physical training. She has participated in the organization of Texas A&M’s annual Student Conference on National Affairs (SCONA), serves on the Ambassadors Council, and is co-president of the Alexander Hamilton Society at the Bush School. Otto spent the summer between her first and second year at the Bush School in Germany, spending part of her time on a trip organized by Bush School professor Dr. Gabriela Thornton and the rest in an intensive German language course at the Humboldt Institute in Berlin. Through all of this, Otto has expanded her perspective on public service and her role upon leaving the Bush School. Her professional interest in cybersecurity and human intelligence will soon take her to Fort Gordon in Augusta, Georgia, where she will attend the basic officer leadership course for nine months. Otto owes the Army seven years of service but has yet to decide what exactly her career trajectory will look like. What she does know is her own role within the broader national security structure and how she can apply knowledge gained in both ROTC training and at the Bush School to protect and defend the nation from cyber threats.